The government of Azerbaijan, backed by activists abroad, is engaging in a campaign to gain international recognition of the 1992 massacre of over 400 Azeri civilians by Armenian forces in the village of Khojaly during the Nagorno-Karabakh conflict. While the promoters of Khojaly recognition say their goal is to honor the victims of the massacre, there is also a clear foreign policy element to the campaign. On the night of February 25-26, 1992, hundreds of Azeri residents of Khojaly were killed as they tried to flee from their village, which had been encircled by Armenian forces. By Azerbaijani official accounts, 485 died in the incident. Azerbaijan's top foreign policy goal today is regaining administrative control over Karabakh, and obtaining recognition for the Khojaly massacre has become a key component in the campaign. Baku has even used the term “genocide” to describe what happened at Khojaly -- a move apparently calculated to weaken the moral authority that Armenians have gained as a result of the killings of between 600,000 and 1.5 million by Ottoman forces in 1915, an event far more widely considered to have been a genocide. “As a result of the short-sighted and destructive policy, the Armenian leadership nullified their own attempts to create an image of a long-suffering Armenian nation,” a spokesman for Azerbaijan's Foreign Ministry, Elman Abdullayev, said at a press briefing in Baku on March 1. “The use of the term 'genocide' to describe it -- I would call it a war-crime -- is also relatively new and seems a deliberate decision to counter the Armenians with something equivalent to their own genocide,” de Waal added. The Khojaly campaign has included lobbying efforts to convince legislative bodies at various levels to recognize the massacre formally, as well as public awareness campaigns. This year it also included a petition to the White House to recognize the tragedy formally. So far this year state legislatures in Arkansas and New Mexico have adopted resolutions commemorating Khojaly. Since 2010, legislatures in Massachusetts, Texas, New Jersey, Maine, and Georgia also have recognized Khojaly, with another “two to three” states working on them, said Adil Baguirov, co-founder and managing director of the US Azeris Network. In addition, national parliaments in Mexico, Colombia, Pakistan, and the Czech Republic have formally recognized the massacre. Baguirov said that it is “probably too early” to assess the success of the campaign in achieving concrete progress in support for Azerbaijan's position on Karabakh. Azerbaijan's disappointment was clear. “This statement indicates that the United States does not have concrete position on the Khojaly genocide and it remains indifferent to the crimes committed against humanity,” Abdullayev, the Foreign Ministry spokesman, told the website Trend.az. In Mexico City, a memorial to Khojaly features a plaque that describes the massacre as genocide. An advisory board appointed by the city government has recommended that the word “genocide” be removed from the monument. The issue hasn’t been resolved, so the plaque remains for the time being. 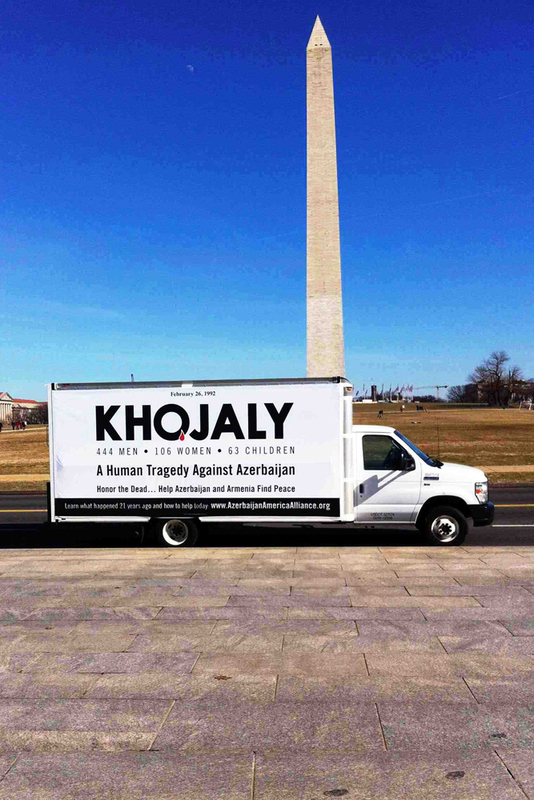 Some supporters of Azerbaijan say privately that a Khojaly advertising campaign – which features signs in Washington, DC, metro stations and bus stops, and trucks painted with the message “Khojaly – A Human Tragedy Against Azerbaijan” driving around Washington and New York – may be a bit blunt for a public not very aware of the Caucasus. "The Khojaly ads may have been a case of 'too much, too soon,'” said a Washington public relations consultant who has worked on Azerbaijan-related issues, and asked not to be named. “Ideally, the first ads would have built up the national brand by introducing Azerbaijan to Washingtonians.” The consultant suggested that a more effective strategy would have been a photo of Presidents Obama and Aliyev shaking hands, with a caption describing the two countries' joint interests. Joshua Kucera is a Washington, DC-based writer who specializes in security issues in Central Asia, the Caucasus and the Middle East. He is the editor of EurasiaNet's Bug Pit blog.